Adopted by the faculty on May 31, 2000, the Conceptual Framework systematically evolved over a 15-month period as faculty worked together in large and small groups to develop a document and a knowledge base that truly expressed the current identity and intellectual philosophy of the Unit . As an integral part of developing licensure programs that reflect the new Ohio teacher education standards and align with current NCATE and learned society standards, the faculty in the College of Education and Human Services created the new Conceptual Framework within the context of the existing Mission Statement and Belief System. 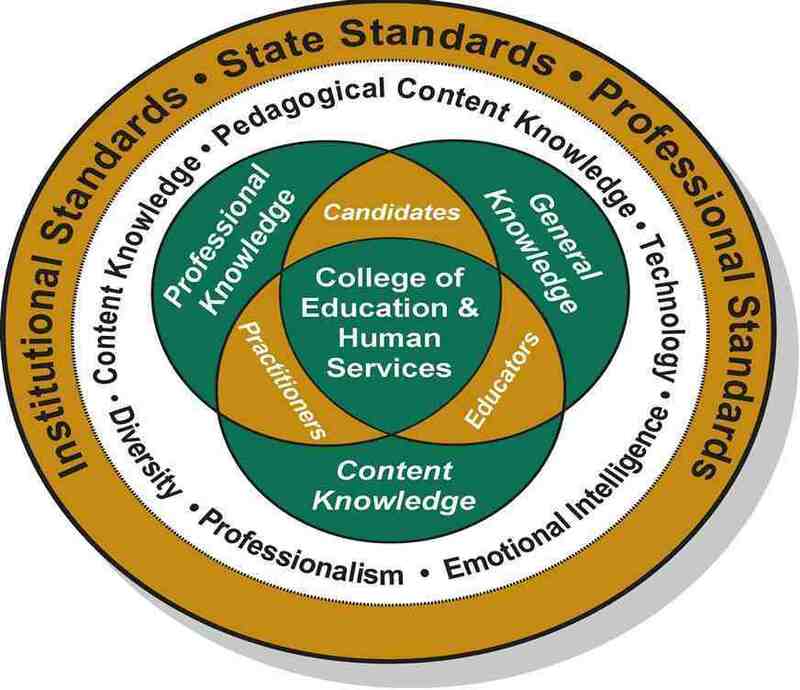 The outer circle of the Conceptual Framework graphic illustrates the larger context of Institutional, State, and Professional Standards. At the center of the circle is our Conceptual Framework title, which depicts the common ground between General Knowledge, Content Knowledge, and Professional Knowledge in each of the professional variations— teaching, leadership, and counseling. This common ground is specifically articulated for our institution through the six strands identified as Content Knowledge, Pedagogical Content Knowledge, Diversity, Technology, Professionalism, and Emotional Intelligence. As an integral part of developing licensure programs that reflect the new Ohio teacher education standards and align with current NCATE and learned society standards, the faculty in the College of Education and Human Services created a new Conceptual Framework (Developing the Art and Science of Teaching/Leadership/Counseling) within the context of the existing Mission Statement and Belief System. Adopted by the faculty on May 31, 2000, the Framework systematically evolved over a 15-month period as faculty worked together in large and small groups to develop a document and a knowledge base that truly expressed the current identity and intellectual philosophy of the Unit (Conceptual Framework Timeline; former Framework: Educator as Problem Solver and Developing Professional, 1987–March 2000). The process began with the creation of individual conceptual maps for content areas of expertise. After these content maps were presented at a College-wide faculty meeting, a small working group conducted a thematic analysis of the maps to identify patterns or common themes that served to connect these individual maps and described the work and philosophy of the College. This analysis clearly revealed the presence of six thematic strands that ultimately evolved into the Unit’s conceptual framework, which the faculty entitled “Developing the Art and Science of Teaching/Leadership/Counseling”—professional disciplines served within the Unit for the preparation of teacher candidates and candidates for other professional school roles. The CEHS mission, Preparing professionals to meet the educational and human services needs of a diverse, democratic society, and the four themes of the National Network for Educational Renewal (a. enculturation into a social and political democracy, b. access to knowledge for all, c. nurturing pedagogy, and d. responsible stewardship) continue to serve as the overarching umbrella for the new Framework. The development of the Framework itself was the result of collaborative contributions made by Unit faculty, educators from the Partner Schools, University administrators, and faculty from the arts and sciences. These six strands also serve to provide consistency in the process of embedding the Framework across the curriculum and through all programs of study. The knowledge base for the Framework, for example, is founded on major resources selected from the bibliographies of the benchmark courses identified in the programs of study. In addition, assessments identified for the monitoring of candidate progress in each benchmark course are to be aligned with the Unit’s Conceptual Framework and appropriate learned society guidelines. These assessments include practicum and internship evaluations—culminating experiences where our candidates are to demonstrate a positive difference in helping all students learn (Field Experience Assessments). The six strands are further interwoven to articulate the Unit’s firm commitment to diversity and technology, which is addressed in the Unit’s Belief System, embedded across the curriculum (course syllabi), and specifically referenced in the Unit’s Assessment Plan and the CEHS Technology Plan. The Conceptual Framework also serves to provide coherence and consistency in program alignment with the Interstate New Teacher Assessment and Support Consortium principles (INTASC - Conceptual Framework Alignment) and the National Board of Professional Teaching Standards (NBPTS - Conceptual Framework Alignment). Here again, the Framework reflects INTASC principles and NBPTS standards which, in turn, are aligned with programs preparing teacher candidates and candidates for professional school roles. The Framework also reflects Ohio’s commitment to preparing “A caring, competent, qualified teacher” for every classroom. (History of Recent Educational Initiatives in Ohio; Ohio’s Vision for 2006 – A Caring, Competent, & Qualified Teacher in every classroom). Teacher candidates and candidates for professional roles are knowledgeable in their chosen fields. This strand represents our commitment to assuring professional educators/leaders/counselors and candidates are knowledgeable in their chosen fields and can impart this knowledge to help all students/clients learn, achieve goals, or change behaviors. This knowledge is not limited to known and existing information, but includes the ability to generate and understand innovations in the field, and the possession of the skills and dispositions necessary to remain current in the field. Content Knowledge includes a broad general foundation in the arts and sciences, as well as a depth of knowledge appropriate for each level of expertise in a specific field. Content Knowledge is essential for critical thinking and problem solving in a professional role. Content Knowledge interweaves with the other five strands in the Conceptual Framework to develop the art and science of teaching/leadership/counseling. Content Knowledge is necessary to make appropriate pedagogical and/or clinical decisions based upon one’s knowledge of diverse groups, of technological applications to support learning, of emotional intelligence to establish rapport and communicate effectively, and of the qualities and dispositions of a professional educator/leader/counselor. Teacher candidates and candidates for professional roles demonstrate appropriate pedagogical content knowledge to help all students learn. This strand represents our commitment to assuring professional educators/leaders/counselors and candidates are knowledgeable and able to integrate knowledge of human development, behavior and learning, curriculum, classroom management, and content-appropriate strategies to provide effective intervention, instruction and assessment for all student/clients. Pedagogical Content Knowledge is the ability to contextualize classroom practice or clincial practice based upon knowledge of how people learn/change in a particular content area and how that learning or change can best be facilitated. Professional educators/leaders/counselors and candidates should be able to demonstrate pedagogical content knowledge by anticipating and recognizing common misconceptions, typical misunderstandings, and developmentally appropriate responses to instruction and assessment for the content area. Pedagogical Content Knowledge interweaves with the other five strands in the Conceptual Framework to develop the art and science of teaching/leadership/counseling. Pedagogical Content Knowledge is necessary to make appropriate pedagogical decisions based upon complex interconnections with the other strands. Pedagogical Content Knowledge interacts with pedagogical knowledge to develop content appropriate instruction and assessment in the context of understanding the diversity of students’/clients' backgrounds, experiences, motivations, learning styles, abilities and interests. Other interactions include the potential for technology to broaden the scope of readily accessible knowledge and enhance instruction, behavior change, the impact of emotional intelligence on knowledge acquisition, and the professional qualities and dispositions of the educator/leader/counselor. Teacher candidates and candidates for professional roles are knowledgeable, competent, and sensitive in working with diverse populations and in diverse settings. This strand represents our commitment to assuring educators/leaders/coun selors and candidates are knowledgeable, competent, and sensitive in working with diverse populations and in diverse settings. This strand includes valuing diversity as socially and culturally beneficial, appreciating the contributions of diverse populations, understanding how to adapt personal responses and professional practices in different contexts, and supporting equitable access and outcomes for all populations. Diversity interweaves with the other five strands in the Conceptual Framework to develop the art and science of teaching/leadership/counseling. Diversity is an important component in framing content knowledge, delivering services to meet individual needs, making pedagogical decisions and applying technology to facilitate learning. Diversity is fused with the development of Emotional Intelligence and Professionalism to facilitate sensitive and respectful communication in all settings. Teacher candidates and candidates for professional roles apply appropriate technology to add value to the learning process. The technology strand represents the Unit’s commitment to assuring professional educators/ leaders/counselors and candidates are knowledgeable and able to make thoughtful, appropriate applications of technology to add value to the learning process, to determine the essential conditions for effective use, and to understand its powerful role in shaping individual lives and society. Technology interweaves with the other five strands in the Conceptual Framework to develop the art and science of teaching/leadership/counseling. Technology is an important component in making appropriate content and pedagogy decisions related to appropriate assignments and activities, research requirements, and information technology literacy requirements. Technology can support the application of emotional intelligence to enhance student learning and client outcomes for diverse populations through innovative options for instruction and assessment. Technology can also support professionalism by facilitating productivity, planning, and administrative functions. Teacher candidates and candidates for professional roles understand and demonstrate the qualities and dispositions of professionals. This strand represents our commitment to assuring educators/leaders/counselors and candidates understand and demonstrate the qualities and dispositions of professionals. Professionalism is demonstrated through communication and collaboration skills evidenced in interactions with other professionals, community members, students, clients, and families. Team building and the principles of lifelong learning are included in the shared values of education and human services professions. Professionalism interweaves with the other five strands in the Conceptual Framework to develop the art and science of teaching/leadership/counseling. Professionalism is an important component in guiding content knowledge applications and pedagogy decisions, communicating effectively with technology, appropriately demonstrating the five emotional intelligence attributes (as listed below), and in engaging in relationships with diverse populations or in diverse settings. Teacher candidates and candidates for professional roles develop Emotional Intelligence and are cognizant of its significance as a positive disposition in teaching, learning, and adjusting in life. Emotional Intelligence interweaves with the other five strands in the Conceptual Framework to develop the art and science of teaching/leadership/counseling. Emotional Intelligence is an important component in learning and guides professional practice in selecting content, pedagogy/ techniques, and technology to facilitate learning and/or behavior change/growth for diverse populations. Since its adoption by the faculty of the College of Education and Human Services, the Unit’s Conceptual Framework has proven to be a dynamic model that has served to guide the College in the coherent alignment of its programs of study with major changes in state, professional, and NCATE standards. The Conceptual Framework was designed to represent the Unit’s commitment to preparing competent educators and other professional school personnel who value knowledge and are capable of critical thinking, inquiry, and problem solving in the professional roles of teaching, leadership, and counseling. The Framework also represents the expectation that we, as professionals in the disciplines of teaching, leadership, and counseling, will model these same attributes with integrity, fully embracing our roles as stewards of the specialized knowledge, skills, and dispositions essential to the Art and Science of Teaching/Leadership/Counseling.